The KXIP opener starred for Balkh Legends in three straight Afghanistan Premier League matches. 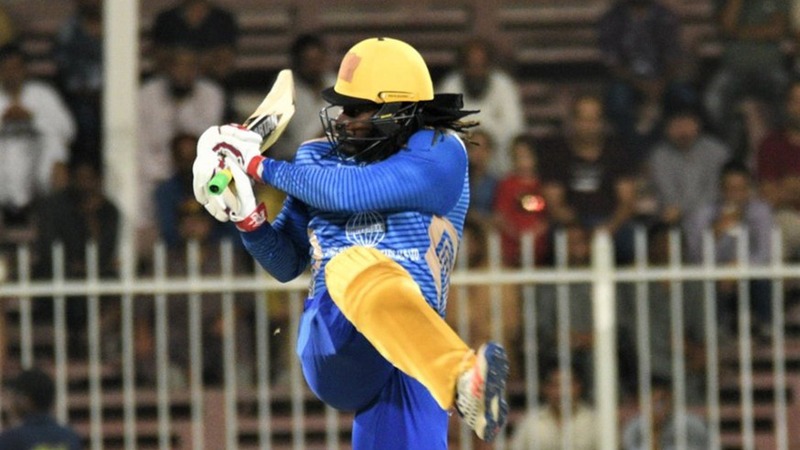 Chris Gayle has been in scintillating form in the Afghanistan Premier League played at Sharjah with his last three innings bearing 20 sixes alone. Playing for Balkh Legends, the Jamaican made a modest start to the league before smashing three straight fifties and earning two Player of the Match awards that took his side to the final of the inaugural tournament. The blitz started against Kabul Zwanan when he blazed 80 runs in just 48 balls, with two fours and 10 sixes, laying the foundation for a 21-run victory as his side racked up a daunting 244/6. He made a slow start to the innings but unleashed once he set his eye in, smashing 73 runs off 28 balls, before easing up a bit again before his run out. Colin Ingram suffered the worst of the onslaught as he went for 32 runs in his only over, with Gayle accounting for 23 of those with three sixes and a four. Kabul's response was explosive too, led by Hazratullah Zazai's 17-ball 62, which included six sixes in an over and the fastest 50 in 12 balls, a record jointly held by Kings XI Punjab stars Yuvraj Singh and Gayle. "It was a surreal moment for me to perform in front of my idol (Gayle)," Zazai said after the match. What a day at the office boss. Then on Thursday against Kandahar Knights, Gayle delivered another storm with a 22-ball 73, with five fours and eight maximums, at an astonishing strike rate of 331.81. Chasing 142, he hit a six off just the second ball of the innings and continued his plundering from thereon. In the last seven balls that he faced before his dismissal, he managed to add a massive 33 runs. Balkh Legends went on to win the match by six wickets and 13 balls to spare. In the semi-final against Nangarhar Leopards on Friday, Gayle racked up his third straight fifty, his 54 in 30 balls relatively calmer than the earlier two innings. Nine fours and two towering ones helped in laying the foundation as his team set a mammoth 235/5 at the end and went on to win by 171 runs to reach the final, which will be played on Sunday. In the three innings, Gayle scored 207 runs at an average of 69.00 and a staggering strike rate of 207.00.